Bacillus Laterosporus Review, Candida Yeast Killer or Not? Bacillus Laterosporus BOD was supposedly discovered by Boyd J. O'Donnell in the late 1980's while he was visiting Iceland. He was intrigued by the health of the plants they grew without the aid of fertilizers. Soil samples were taken and further studies revealed the soil's growing power to be a species of bacteria that was later named Bacillus Laterosporus BOD. 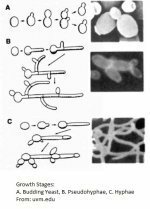 O'Donnell patented this bacteria as a candida yeast and aspergillus killer in 1994 and all sub-strains thereof. B Laterosporus is a spore bearing bacteria so it survives the stomach acids intact. Spore bearing means it is basically encapsulated within itself. It does not have to be refrigerated so it will not spoil and grow molds in the body. Once introduced to the intestine the spores begin to germinate and multiply every 32 minutes. However, this is a soil based bacteria and like all soil based bacteria's it will not set up large long-term colonies of bacteria in the intestine. The effects are transitory and the colonies will begin to die within 3 days or so. Testing has shown it to be completely safe. It contains no dairy, gluten and animal substances. Does B Laterosporus Work for Yeast Infections? There are numerous studies over on the American Society of Microbiolgy website that have been performed on over 30 substrains of b laterosporus as an insecticide for mosquito's. This study that was performed by Microbiologists Mohammed Hassi, Souraya El Guendouzi, Abdelleatif Haggoud, Susana David, Saad Ibnsouda, Abdellah Houari, and Mohammed Iraqui, and published in the Brazilian Journal of Microbiology in 2012, has shown that the compounds b laterosporus produces does have antimicrobial activity against Streptococcus mutans, Staphylococcus aureaus, Clostridium and Gram- negative Bacteria such as Escherichia coli and Pseudomonas putrefaciens. It also had antifungal activities against the yeast Candida albicans. This study was published in February of 2013 in Applied Microbiology and Biotechnology, reveals that b laterosporus produces chitinase enzymes that exhibited antifungal activity against the phytopathogenic fungus Fusarium equiseti. Chitinase enzymes would also be useful for digesting the cell wall of yeast. Just so you know, Chitinase activity is also found in the enzymes Cellulase and Hemicellulase. In 1986 Applied Biological Sciences Laboratory tested 5 gram doses, which is equivalent to about 2000 capsules for a 170 pound person and could find no toxicity issues what so ever. They concluded that Bacillus laterosporus is in no way harmful to humans. For the first three days take 5 capsules four times a day at least 30 minutes away from food with the enzyme twice a day. After those three days drop the dose to 5 capsules two times per day and use the enzyme formula one hour before breakfast and 30 minutes before bedtime. At the end of those two weeks, go back to taking B Laterosporus BOD at the 5 capsules four times a day for three days. After those three days go back to the lower dose for another two weeks. Then back to the three days at 20 capsules a day and so on as long as needed. I do suggest you keep doing this for at least 30 days after all symptoms have disappeared. You might also want to consider using it for maintenance for a while but that is ultimately your choice. You can take less than what I have suggested above if you wish, you are the doctor and only you know how you feel. However, it could take longer to get well at lower doses, it just depends upon how bad your infection is. 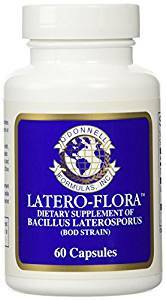 Any of these Bacillus Laterosporus BOD products at Amazon will work. This probiotic is not meant to build up good bacterial colonies if you are low on good bacteria. It works best as a yeast and bad bacteria killer. CP-1 or the 11-Strain are what you should use for building good bacteria levels during the two week cycle or after on a long term basis. Like all probiotics if you are not used to taking them it is possible during the first five to seven days to have a slight bloating, or a feeling of being plugged up, effect. It could possibly be a little harder to have a bowel movement as well. These problems tend to clear up after that first week as the probiotic cleans you out. From there, no more problems are felt. If you can find any other studies related to Bacillus Laterosporus BOD, I want to know about it so please contact us through the contact page of this website.